At Fakenham Parish Church we welcome your decision to have your child christened. During the christening service your child will be “baptised” with water. Christenings usually take place on one Sunday of the month at 12.15 pm. They last about half an hour. Occasionally a christening will be part of the 10.30 service in which case a special Order of Service is followed which lasts about an hour and we celebrate together afterwards with a cake baked by the Mothers’ Union. The choice of godparents is important and it is helpful if those chosen have contact with their local church or at least an understanding of baptism. Traditionally three godparents are chosen, and it is important to consider if they will be able to support the child and be part of their lives during their early years. 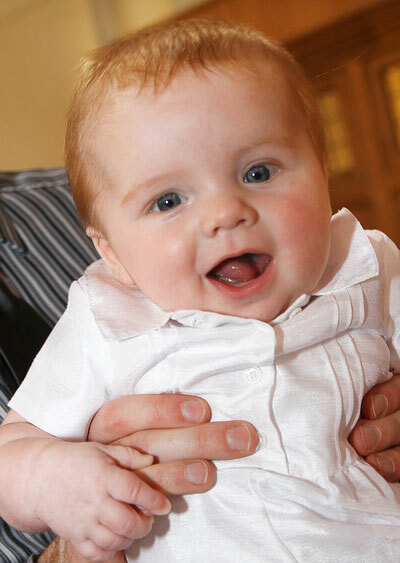 Godparents must be christened or be prepared to undertake instruction prior to becoming a godparent so they may be christened either during the same service or prior to it. Photography is allowed but we would encourage one or two reliable photographers from your family and friends to take some good pictures rather than everyone using their phones or cameras. The church has some parking for the disabled as well as a toilet and a baby changing unit – both helpful if you have guests with small children or who have travelled a distance. There is no charge for a christening. Should you wish to make a donation to church funds please make use of our gift aid envelopes if appropriate. If you have a particular affiliation with a charity and wish to make all or part of your donations to them, please mention this beforehand. Please make your initial enquiry either by phone 01328 862268 or email admin@fakenhamparishchurch.org.uk . Alternatively pop in to Stepping Stones our toddler group on a Monday morning at 9.45am, Messy Church on the third Sunday of each month from 3.30pm-5.30pm or come along on a Sunday morning. If the thought of coming with your baby or child to a full service is too daunting then you could come in at the end of the service (11.40am ) and introduce yourselves over coffee. Preparation for baptism varies according to your context. It is important to know that a christening is the beginning of a fresh chapter in your child’s story, or in your own if you are an adult. Are you ready to read on? For information about our Seekers’ Courses (which look at the basics of the Christian faith and what Christianity is all about), please click here.